ATLANTA, Sporting Alert — First half goals from Darren Mattocks and Giles Barnes and solid defending in the second half piloted Jamaica to a 2-1 victory over the USA in a Gold Cup semi-final game at Georgia Dome on Wednesday. 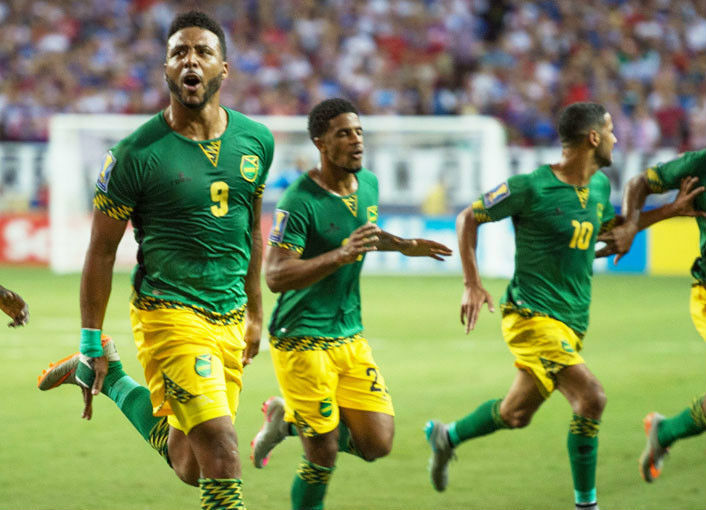 The Reggae Boyz, who came into the game as serious underdogs, absorbed the early pressure from the home side and then struck twice after the half-hour mark to secure a place in their first-ever CONCACAF Gold Cup final. It was also the first time the Caribbean side was beating the United States on its home turf. The defending champions started brightly and tested Jamaica several times, but the Caribbean champions defended smartly. Jamaica then took the lead against the run of play when Vancouver Whitecaps forward Darren Mattocks scored with a brilliant header in the 30th minute. Kemar Lawrence delivered a long throw inside the area from the left-hand side, which was met by Mattocks, who leaped above his marker John Brooks to head past Brad Guzan with the ball hitting the left-hand post and crossing the line. Six minutes later Barnes extended the Reggae Boyz’s lead to 2-0 when he punished the hosts for giving away a silly free-kick on the edge of their 18-yard box. The Houston Dynamo forward stepped up confidently and beat Guzan with an exquisite free-kick from 20 yards. Goalkeeper Ryan Thompson made a few key saves after the goals to help Winfried Schafer side take the two-goal advantage into the halftime break. However, two minutes into the second half Thompson failed to hold on to a shot from Aron Johannsson and his spill fell straight to the feet of Michael Bradley and the American captain fired home to cut the score to 2-1. The defending champion went in search for an equaliser but were unsuccessful as Jamaica defended right to the end to upset the five-time champions and advanced to next Sunday’s final against either Mexico or Panama.